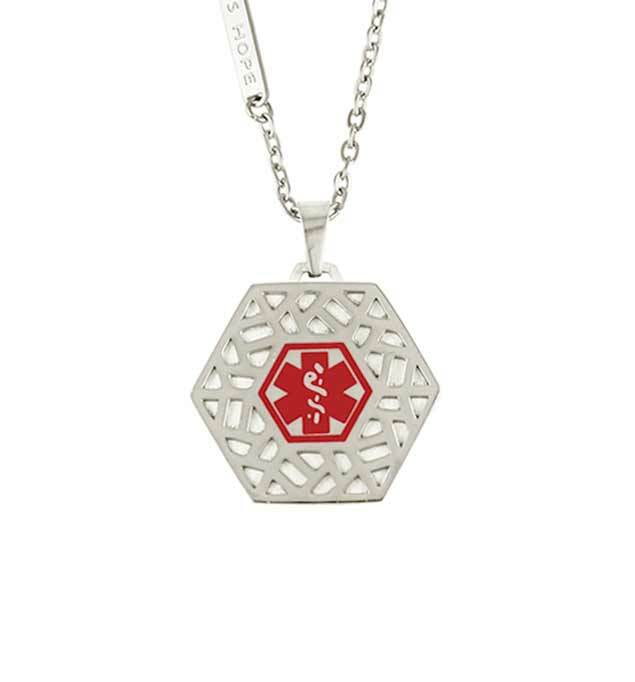 The Fusion Med ID Necklace is an on-trend, hexagon-shaped pendant with geometric cutouts and a red medical caduceus symbol on the front, which serves to alert first responders to your medical information, which we will custom engrave on the back. Featuring intricate detailing and an unexpected shape, this modern medical alert pendant comes on a stylish, hypoallergenic, nickel-free necklace, adjustable from 20-23 inches. Whether you or your loved ones wear medical IDs for heart conditions such as arrhythmia, atrial fibrillation (A-Fib), deep vein thrombosis (DVT); food allergies such as peanut, tree nut, soy, or wheat allergies; pacemaker use or other MRI limitations; or for any other medical condition or treatment consideration, medical ID necklaces are an excellent option. Easy to wear and comfortable under or over a shirt, medical ID pendants and dog tags are a great choice for those with dexterity challenges, people whose wrist sizes fluctuate due to swelling, and those experiencing weight changes, as they are size-adjustable and can be slipped over the head without having to open or close a clasp.